For many people reggae music is meant to be cultural, conscious and spiritual. On TLP 26, host Joshua Chamberlain welcomes two of the leading cultural voices in reggae music. On the one hand, Eward Beckford, aka Daddy U Roy, helped solidify conscious dancehall with the arrival of the deejay style which provided a popular vehicle for U Roy's conscious philosophy. He's still one of the hardest working men in reggae today but without any fuss he has handed off the responsibility of contemporary social commentary to the contemporary artists. Luciano, now a veritable veteran, was once the primary cultural voice in the 90s and its most prominent spokesperson at the turn of the century. U Roy and Luciano talk about reggae, dancehall, sound system culture and the importance of staying conscious and cultural in the industry today. Jepther McClymont aka Luciano aka The Messenger is a Jamaican great reggae singer. Born in 1964 in Darvey Town in the Parish of Manchester, Jamaica, Luciano began to work with Philip ‘Fattis’ Burell who produced his first album Moving Up in 1993 followed by Where There Is Life in 1995 which revealed him to the audience. He also collaborated with producers as Freddie Mc Gregor or H.K.R Henry from Sky High label. 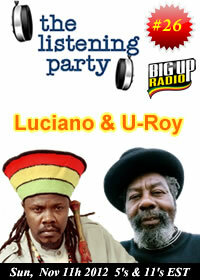 Luciano is a true conscious singer, who sings for Rastafarian edification and African repatriation. He’s a prolific artist and released more than 30 album since 1993. Among them, Messenger released in 1996, Sweep Over My Soul released in 1999 and A New Day in 2001 both on VP records. Luciano is simply one of the icon of conscious reggae since the 1990’s. Born in Jones Town, Jamaica, U-Roy's musical career began in 1961 when he began deejaying at various sound systems. This included a stint operating Sir Coxsone Dodd's Number Two set, while King Stitt "The Ugly One" ran the main set. U-Roy eventually worked with King Tubby at Duke Reid's Sound System in the late 1960s. Around this period, King Tubby had started to experiment with his studio equipment in an attempt to create new effects and sounds, which would eventually lead to a new style of reggae called dub music. With U-Roy as his most prominent deejay and with access to some of Treasure Isle Studios' finest rocksteady rhythms, King Tubby's new sound became extraordinarily popular and U-Roy became a local celebrity. However, his first single – "Earth's Rightful Ruler" – was not a King Tubby collaboration; it was recorded with Peter Tosh for Lee "Scratch" Perry.